Last Friday night was the opening reception for my husband’s show at the Lorinda Knight Gallery in Spokane, Washington. This meant we were going on a road trip! The last time we were in Spokane was to be with my family at Christmas, the entire town was buried under record setting snow. Not a fun trip, there was absolutely no getting out and around to see anything or anyone. The only upside was that it made our winter weather nightmare in Portland look like a cake walk by comparison. A little perspective is always a good thing. It was good to see that, for the most part, my parent’s garden survived the winter. It’s no secret to anyone that knows me that gardening is in my blood. My parents have always had a fabulous garden even back when we lived in the country and water was less than plentiful since we had to get by on an under-performing well. 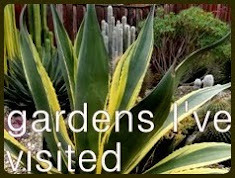 Come to think of it, looking back on all the time my mother spent on upkeep of that garden it is really amazing that I wanted to have anything to do with gardening! 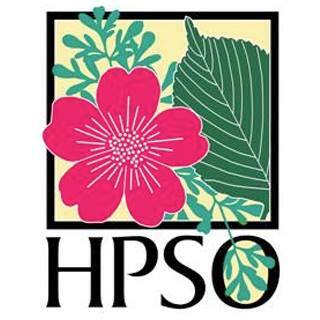 The division of gardening labor at their house is roughly this: mom tends to the ornamental plants in the beds and pots while dad tends to the vegetable garden and the lawn. 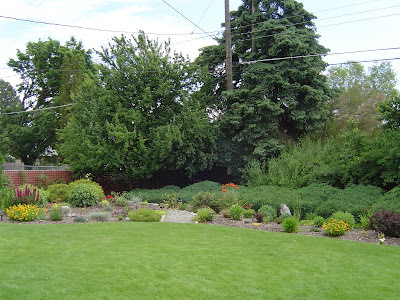 The most beautiful lush green lawn you’d even hope to see, with only organic fertilizer too. Our dog Lila was in lawn heaven. The scruffy clover infested mess that passes for a lawn at our house will never be the same for her now that she knows how good it really can be. First up, dad's veggies. 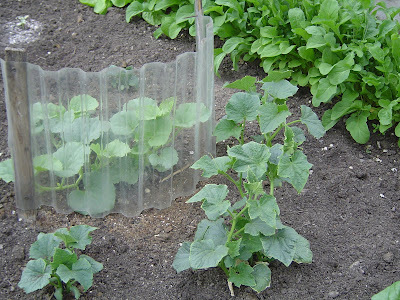 Here are the segregated cucumbers, Armenian behind the clear wall and burpless in front. At first I thought that the wall was to increase the heat on the Armenian but really he just wanted to keep the different varieties separate. That's arugula along the edge, we brought a big huge bag home with us...heaven! Dad has 9 different varieties of tomatoes growing this year. Beats my 5! I commented that my tomatoes were taller. Not trying to compete, as there is no competing with my dad's tomatoes, which are the best. But just happy with how the wall-o-water around mine really gave them a great head start. Dad, I measured and my tallest is 36"... how about yours? That's more arugula around the edge, my parents have became quite the arugula lovers! They have horseradish (below) growing in several spots around the garden. 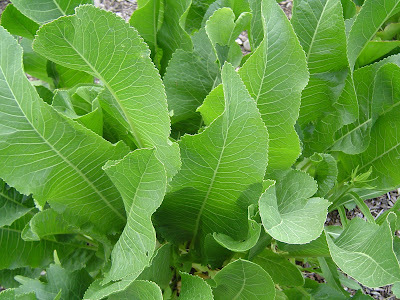 It's leaves are fabulous - but the true value of this plant is the wonderful horseradish root that it produces. That stuff you buy in the store doesn't even compare! They grind it up and add just a bit of white vinegar. Makes the best horseradish crusted salmon... Isn't this lettuce just gorgeous? I forgot to ask but I believe it's butter? 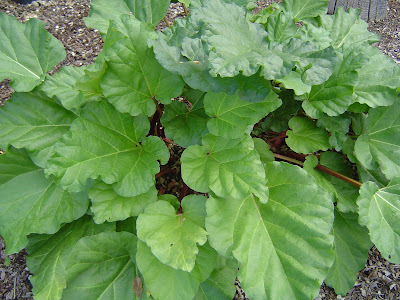 Now we are out in mom's territory, but this one could certainly be in the produce section too, it's rhubarb. Makes a great strawberry rhubarb pie...which we have in the fridge! Thanks mom! 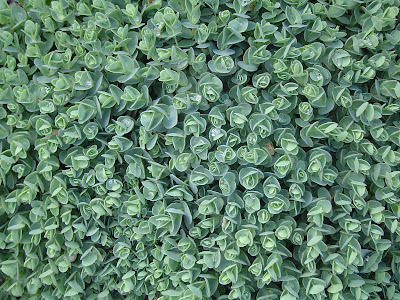 Sedum ewersii, a beautiful ground cover. I don't remember seeing this variety before. 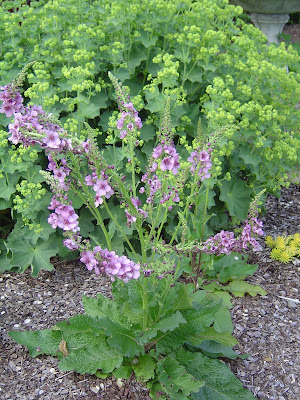 The plant in front is Mullein Verbascum 'Southern Charm' and Lady's Mantle behind - my photo didn't do this combo justice, they were really beautiful together. 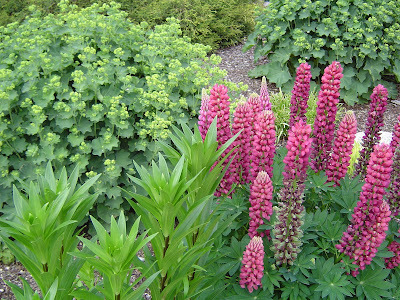 Love this combo - behind more Lady's Mantle, Lilly's on the left and Lupine on the right. So vibrant. I wish I could see it when the Lilly's bloom. 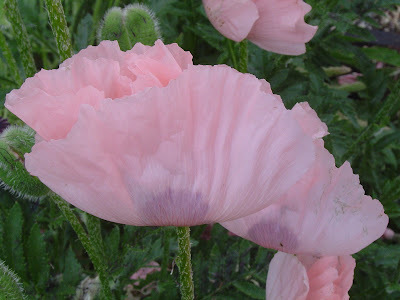 Mom has several beautiful poppies, they were all in various stages of blooming. Not sure what I like best the fuzzy buds, the papery flowers or the seed pods they leave behind. I couldn't believe how this clump of Iris has multiplied! 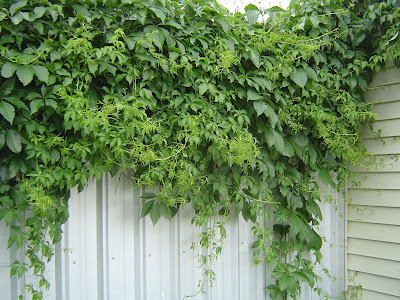 Love how the Virginia Creeper takes over the side of my dad's shop every year. I wish the back of our house were metal so I could let it grow up with out damaging like it does the wood siding. This unknown plant (label lost over the years) looks like someone took a paintbrush and dabbed white paint all over the leaves. It blooms tiny blue flowers that to me look a little like Statice. Anyone know what it is? 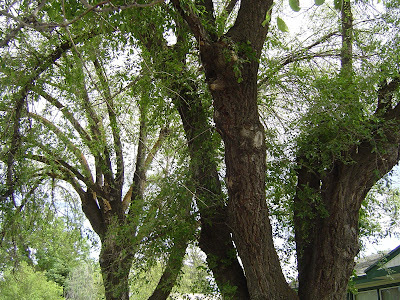 And last up, their Elm trees. Huge old craggly specimens that loom over the front of the house. They provide shade from the afternoon sun but are constantly dropping leaves and twigs on the front lawn. It's one of those love/hate relationships. What a lovely garden. 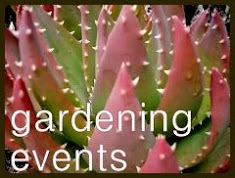 I always love to hear about gardening couples cooperating on the effort. I want to say your mystery plant is a tricyrtis of some kind, but I'm not feeling very confident of that. That little sedum is lovely. And these days it's getting to be a bigger treat to see healthy, mature elms. Who says you can't go home again! Hey welcome back. I feel like a big jerk for not saving you that colocasia. The thought did occur to me, but too late. Your parents are quite the gardeners. Usually it seems to skip a generation, kids with parents who spent a lot of time in the garden tend to come away with a bad taste in their mouth, but I'm glad not in this case. 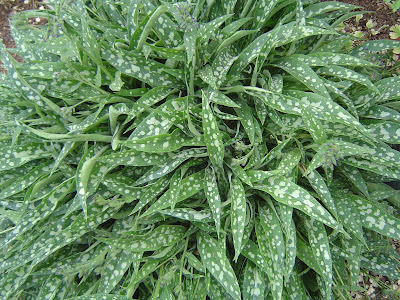 Is that mystery foliage that of a pulmonaria? Jane...you are so right about the cooperating, it's kind of rare isn't it? Thanks for the idea on the tricyrtis but I think Megan called it (below). I first left Spokane in '87 and then moved back in '98 to leave again in '04. This time home I got to see lots of old friends and found myself wondering if there will be another time where I live there ever again. It would be SO HARD to go back to a zone 5 after living in Portland. Megan...you've got it! I think it is a pulmonaria! I'll let mom know, she'll appreciate the ID. You are kind to even have thought about saving the Colocasia, I was just having fun harassing you. How would you know? But I do see a promising future here. 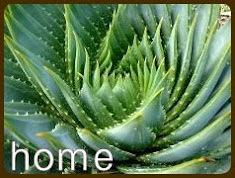 We can make a plant 911 nursery emergency line and be on the look out for the rare and unusual! (you think I'm kidding but I'm not!). BTW the gardening bug didn't seem to skip a generation with you either, unless I am misreading your mom's level of dedication. What about your siblings are they into it? I've got 2 brothers and one is a gardener and one is not. Wow, Loree, you have to let your mom and dad know that you have people all over the internet drooling! 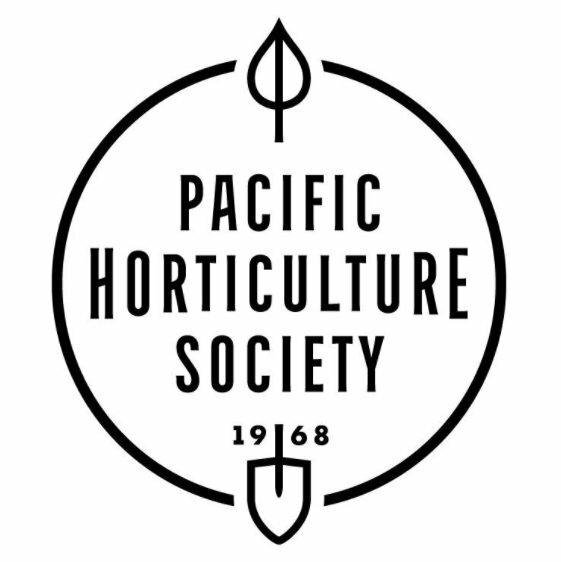 So many of their plants are the exact plants I've dreamed of growing, but my zone is too hot! Here's that zone envy thing again! Lady's mantle, especially, was something I wept over. 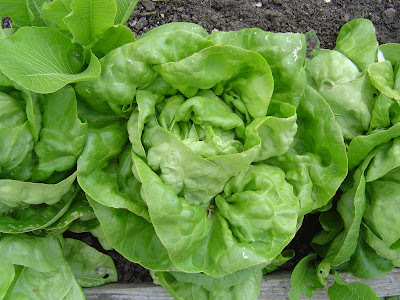 And we can't get our lettuces to head down here unless we do it in the dead of winter, and it takes forever! We have to harvest our lettuces as baby mesclun or we get all icky bitterness. SIGH! So while my aloes and agaves are awesome, I'll never have a fresh rhubarb pie like you will, and my arugula will always be a bit too peppery. Sedum ewersii looks like tiny roses... very lovely. This garden is so amazing. 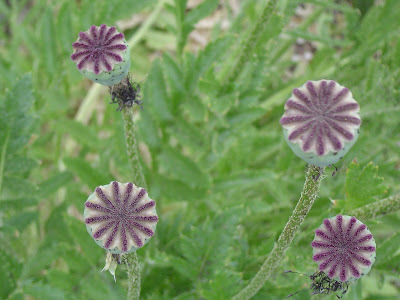 Not only has plenty of unique beautiful flowers, but healthy looking vegetables too. The butter lettuce look so yummy. Very good job;-) Oh, regarding caladium, it is easier to plant those that love the sun. Fun road trip! Your folks' garden is amazing. 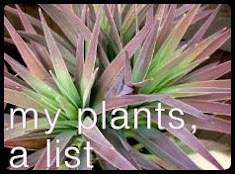 Some of those plant combos (and your photos) look like they came straight out of a (good) gardening book. 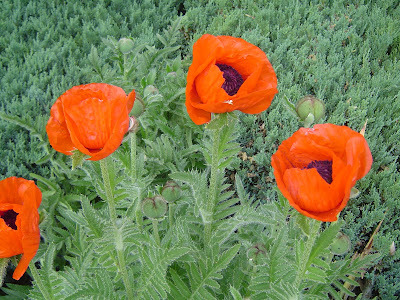 Love those poppies, I have them too, same colors and type, agree on all counts that they are worth the space. Agree that is a pulmonaria, or lungwort. That one is really nice! 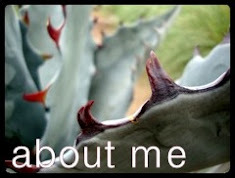 I have a new one that I put in a bad spot, it is kind of sprawling and not looking nearly so spunky as your mom's. That variegated iris is to die for even without the pale purple blooms, and your dad, way to go with the awesome veggie garden! I love the arugula "edging" - that's really kind of artistic and sculptural. Is he separating the cukes so he can save seeds? 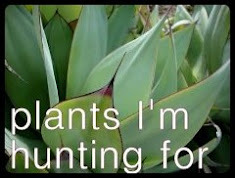 BTW, my mom is a crazy gardener so I was not too into it until I got older, now I am hooked but much lazier than she and my dad are. Germi, I will make sure they know, thank you! It's always a trade off isn't it? And so often the thing you have isn't what you want. Mom's Lady's Mantle is always beautiful, unlike some of the flop-over plants I've seen elsewhere. 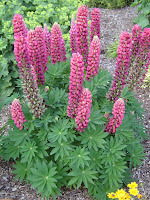 Stephanie, you are so right about the sedum! I didn't pick up on that but it definitely does look like little roses. 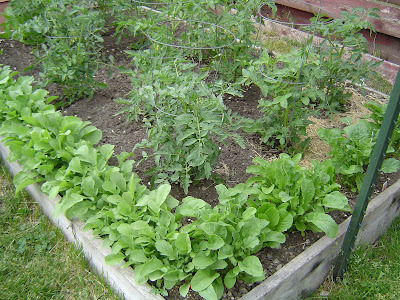 Posting the picture of the lettuce I was wishing I had "accidentally" grabbed one, they looked so good. Karen I didn't ask if he was planing to save the seeds, I'll have to do that. Mom's pulmonaria is in a fairly shady spot, although it does get good afternoon sun I think. 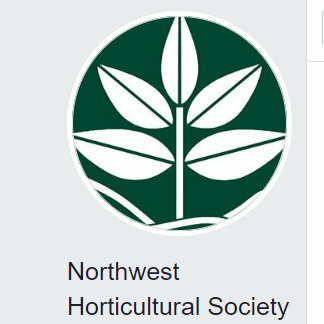 Do your parents garden in Seattle? 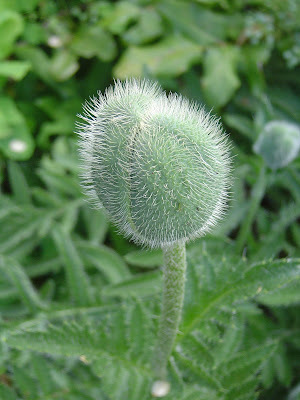 My 1 poppy was blooming this morning...nothing so elaborate as my mothers though!